Weston: With extreme sadness, we announce the passing of Harold (Bunk) Weston, 86, at the Brandon Regional Health Centre on the evening of March 22, 2015. 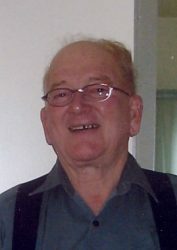 Bunk was a long serving member of the Odd Fellows Lodge, and was a carpenter by trade for over 50 years in Hartney and area. He had a reputation for being the “best” at his work and was frequently called upon to build homes for family and friends. Bunk married Margery Davreux and despite not having children of their own, were like a second set of parents for their nieces and nephews near and far. Beyond work and family, Bunk’s passions were his love of dogs, fishing and camping. There was always a four-legged “child” in the home to be spoiled rotten and taken everywhere. As hard as Bunk worked, he always cleared his schedule spring and fall for a fishing trip with family and friends (usually up north in Manitoba). Camping was often associated with work projects in the area during the warmer months. This way, he and Marge could meet some new people, enjoy the outdoors, and sit around the campfire in the evenings. In retirement, Bunk swapped his big tools for smaller ones in order to create clocks and hanging shelves that demonstrated the patience and attention to detail so characteristic of his work. During his later years, Bunk resided in Brandon with his companion, Gladys. They did some travelling and made some new acquaintances wherever they lived in the city. Bunk is survived by his Aunt Gabie, cousins, brothers and sisters-in-law, and numerous nieces and nephews.Funeral service was held at the Hartney Centennial Centre on March 27, 2015 with Rev. Barb Alston officiating. Interment was in the Riverside Cemetery, Hartney, Manitoba. In memory of Bunk, please make donations to the Brandon Humane Society, 2200 17th St. E., Brandon, R7A 7M6. Be happy as I go out to sea. Our sincere sympathy on the passing of Bunk. He was truly a man who we both really enjoyed and respected. Our thoughts are with his family and friends at this time. Sincere sympathy to the family of Bunk, we always enjoyed having a visit with him and Gladys when we ran into them in Brandon. He was always friendly and happy to have a visit. My sympathy to you Gladys on the passing of Bunk, and to all his family. I remember him being at my parent’s home from the time we moved to Hartney. He was always so kind and friendly. I’m sure you have many wonderful memories of him and I hope those are of comfort to you at this difficult time.